The culture of Grand Canyon University is portable. Students regularly take it with them when they leave the campus boundaries to volunteer in the neighborhood, across the city and around the world. They get up early on Saturday mornings to help Habitat for Humanity Central Arizona renovate nearby homes and to minister to children who join them at the Canyon Kids program in local parks. They reach out with a smile to the homeless, the abused, the elderly and anyone who just needs a hand. Helping on Habitat for Humanity projects is one of the many ways students volunteer off campus regularly. But that same culture also brings neighborhood residents onto campus to get the help they need in school and in business, through programs such as the widely acclaimed Learning Lounge. As much as GCU has developed into a little town within a campus, it is also very much a campus within a city. Full circle of togetherness and inclusiveness. Full circle of benefits. Around and around it goes, where it stops … well, it doesn’t stop. 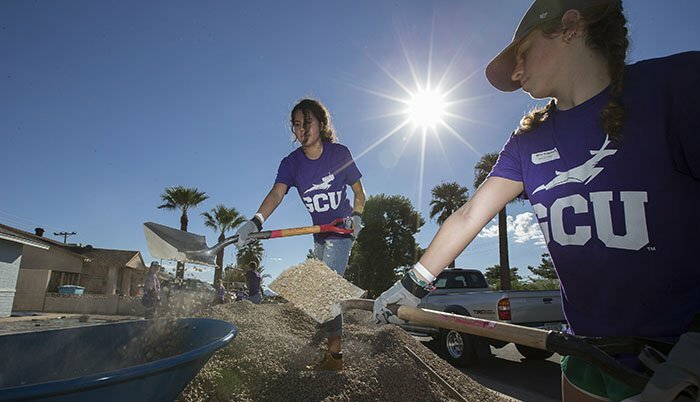 The program that has gotten the most attention is GCU’s partnership with Habitat for Humanity, which aims to renovate 700 homes in the neighborhood and already has done more than 100. On Serve the City day in early October, nearly 300 students who might otherwise have spent their Saturday morning sleeping chose instead to pick up paintbrushes, shovels and wheelbarrows and spend the day toiling for their neighbors. Freshman roommates Madeline Lindey and Madison Lawson had a dance-off while painting. Junior Kyle Hammond said he wasn’t surprised by the positive atmosphere the students carried on. “I think we all understand the meaning of wanting to give back to a community that has blessed us,” he said. GCU’s Local Outreach Ministries has eight programs in which students fill a variety of needs outside the campus borders. The students’ inward benefits are equally as important. “Serving teaches people the heart of Christ, who they are in Christ and who God created them to be,” said Jaci Curran, the program’s manager. The smiles of the student volunteers at Habitat for Humanity projects paint a picture of a group that’s having fun. One of those programs is at Colter Commons, an apartment complex just east of campus that students visit twice a week. Sophomore Tyler Guenette and junior Jonathan Herrell said their Thursday nights in Lanaye Zummallen’s apartment are a highlight because of the way she shares poetry, art and wisdom. “She talks about following the heart,” he said. Friday mornings, the GCU Best Buddies expand the bounds of servant leadership by volunteering their time to serve as mentors and buddies for children and adults with developmental disabilities at the local Arizona Centers for Comprehensive Education and Life Skills. For freshman Brisa Castro, the social interaction re-establishes her career choice in education and reminds her of being told as a sixth-grader that she couldn’t take advanced-placement courses. The Small Business Consulting Center was created this year by the Colangelo College of Business to help local entrepreneurs get the know-how and community-consciousness principles they need to thrive. But it also helps students. They are taught the principles of “Conscious Capitalism,” which emphasizes doing business with a higher purpose in mind, then get to apply them as they assist community businesses. Students also help operate GCU’s hotel and golf course. “Instead of students working on fictitious problems, here’s the real thing,” said Eduardo Borquez, manager of the Small Business Consulting Center. 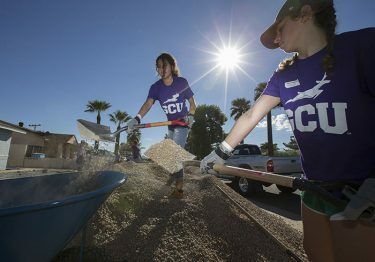 The outreach of GCU students isn’t limited to the neighborhood. Nearly 300 full-time undergraduates will go on GCU Global Outreach-sponsored missions to 20 countries this academic year, but it will have extra special meaning for one of them, Christine Barna. The first time Barna met an American missionary, she was a 9-year-old in a Russian orphanage. She was prepared to meet what she’d been told were “rich Americans,” but Barna remembers the missionaries for their hearts, not their wallets. “I only remember their kindness,” said Barna, who was 8 when her mother died and she was sent to an orphanage. She was adopted by a couple in California at age 10, and next summer the sophomore counseling major will return to Russia, this time as a missionary. “We will find common ground,” she said, “and then I will introduce them to Jesus.” The heart of Jesus through the spirit of a GCU student. Full circle again. It just keeps going around and around.